I was born as the middle child of two sisters. Both are healthy.. thank goodness! Growing up, I was restricted from certain gym class activities; things like running, jump roping, or anything that made me breathe hard from exerting myself too much. What was so great was that my family, especially my sisters never treated me like I was a fragile flower. In a way, that made me stronger inside. Even though I was born with serious heart and breathing problems along with the scoliosis that had me wearing a Milwaukee brace, I was still a kid who rode a bike chasing after the ice cream man, played two years of girls’ league baseball (wasn’t very good), and I was even in a bowling league. I’m sure wasn’t suppose to do all that because of my health but my parents tried to let me experience life as close to normal as possible. There were times where I had to sit out from the fun because it was just too beyond my capability. I was born and raised until I was 12 in Fort Wayne, IN. My cardiologist was in Indianapolis, IN and my Orthopedic doctor was in Minnesota. So there was some traveling for doctor appointments and surgeries. 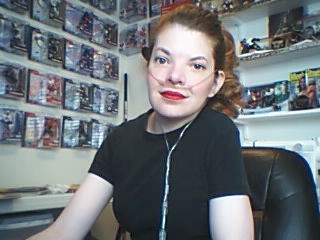 The doctors kept putting off my open-heart surgery to patch the Ventricle Septal Defect (the hole in the wall between the ventricle chambers of the heart) because my pulmonary function was so bad (remember my deformed ribs?). They didn’t think I’d make it through the surgery. By the time I was 10 years old, my step-father convinced the doctors to go ahead with the surgery. For some reason, I knew that I’d be okay but my step-father was worried. Before the surgery, he paid for us to take a ride in a helicopter (he was a helicopter pilot in the Vietnam war) and then he played catch (baseball) in the hospital courtyard with me. I knew what he was doing. I made him a bet before the surgery that I would be in the hospital a total of 7 days. Three days in ICU and four days in regular ward. I think I surprised the pastor of the hospital who came to pray with me before the surgery. I knew in my heart that I would be okay. If I won the bet, I would get a Hershey candy bar. Well, I won and I got my candy bar. It wasn’t until high school that my lungs and heart started showing more signs of trouble. My CO2 was too high and my O2 was too low. I would get tired fast, forget what homework I had to do, I had headaches, and then I got pneumonia. That’s when the doctors figured out that I needed oxygen at night when I slept. It helped some but it didn’t prevent the occasional blackouts I started to have. Those were scary, especially when I started driving. Then depression hit me hard. I became suicidal but never acted on it. I thought about it all the time. I wanted to be normal but I wasn’t and I just had to come to terms with that. After the final car accident I had because I blacked out and totaled the car, my parents revoked my driving privileges for a year. I didn’t KNOW what the blackouts I was having were. After graduating high school, I took a year off from everything and just lived with my parents and got my head on straight. I grew as a person without all the stress of school and no set requirements of daily activities besides living. Then I went out in the world, got a job and found the man who will always love me. I can say I’ve survived a lot in life. I feel as if I’m a survivor. In my opinion, to become a survivor is to live your life in a way that makes you happy even with setbacks in your life. You have to go out in world and find that thing that makes you happy as a person despite your challenges. Christine, thank you for this blog it has giving me hope. I would love to email you and be friends. Your story is so inspirational! Thank you for sharing. Great story.. thank you for sharing. I was looking for information about how to clean a bipap mask for my hubby who has MND. We are in our early forties and only met because of the MND, so I know a little bit about inspiring people (I married one!). Good luck.. Keep looking after yourself and making the best of every day! Thank you for visiting my Living On O2 for Life blog. I am going to have to look up what MND is in a few minutes. I don’t know what MND is. 🙂 But never fear Webmd is always willing to teach me! Yea!! I’m so happy you’ve married such an inspiring man. May you be blessed with a long and adventurous marriage! There’s a post that I wrote covering how to clean a Bipap mask on my blog. Did you find it? My goodness we have so much in common! I too have lived with severe congenital scoliosis for just over half a century due to an in-vitro spinal tumor). Since Sept 2012 I’ve also had to use a BiPAP due to elevated co2, although I am still getting used to it. I also married the man of my dreams, who has been beside me through it all for thirty yrs. I attack life (and cleaning!) in the same manner, believing in my mother’s oft repeated maxim “Where there’s a will, there’s a way” Stay strong and happy. You know, I say that very thing when I have to get something done that’s a struggle for me. “Where there’s a will, there’s a way.” Your mother is a smart woman! 😉 Good to have you part of the Living On O2 for Life gang! Hi Christine. I thought I wrote you, but I guess I did not. I really do enjoy your blog and I nominated you for the Liebster award for bloggers. Check out my post at http://lifewithsarcoidosis.com/2014/02/05/and-the-award-goes-to-me/ for more info. Did you email me? I will go recheck! I’m so sorry that I missed it. I went to your website to read what this award is about. I will get back with you on this! *hugs* Thank you for thinking of me and my blog. Truly I appreciate it!! I thought I let a comment on your blog, but I am not seeing it. No worries! No sorry.. I didn’t get an email or a comment about this. *hugs* I just checked. Wow, I can identify with you on SO many levels, from being a middle child, to having a high co2 and low o2, to being on oxygen 24/7 and the trials and tribulations that go with it, i’m so glad I found your page! Yes Erika.. The dry heaves are from high CO2. My thinking is that while you were sleeping (pre-bipap) you either breathed too shallow to be able to blow off the CO2 or you had sleep apnea. Or both. I would have very bad dreams at night where I felt like I was falling in a deep hole that I couldn’t get out or I dreamed that I was in a car wreck in slow-mo feeling like I was paralyzed in fear. I always felt that was from High CO2 because it was so hard to wake up. I am so glad i found this site. Thanks for being here. Thank you Barbey Brown! I hope you found what you were looking for. Wish you were my girlfriend. You are so beautiful. Thank you for sharing your story!! I have just recently gone on O2 all the time–not 24/7 but only for short—few minutes @ a time or bathing. My family is planning a trip to the beach in October & I’ve been so worried about what to do re:O2 on the beach. I don’t think I’ve ever seen anyone on the beach with O2 so I did a Google search & came up with you!! Although I’ve not had such an affected life as you have I have a condition (bronchiectasis) as a result of an illness (histoplasmosis) I had as a child—-so thank you so much for your revelations!!! If you’re going on the beach and want to bask in the sun with your oxygen tank, you’ll need to put your tank in a plastic bag to keep the sand away and cover it with a towel out of the sun. I’m glad I could help! What type of portable oxygen are you using? I use liquid oxygen which is a lot different than an metal e-cylinder or a battery-powered portable oxygen concentrator. There are smaller metal cylinders that a little less oxygen but are much lighter than the big clunky tanks you see at the hospital. Hi Rachel, liquid oxygen is the liquid form of oxygen that is kept in large reservoirs. They are used by the patient for their needs for filling a small liquid oxygen portable for when a person leaves the house. The patient also can use the oxygen straight from the reservoir for their oxygen needs instead of using an oxygen concentrator. These reservoirs and the portable tank, when filled with liquid oxygen, are pressurized and will evaporate over time. Liquid oxygen and the pressurized e-cylinder of oxygen are the purest forms of oxygen. I hope this helps. Getting liquid oxygen is a little harder to do as not every durable medical company provides it and not every health insurance companies cover it. Let me know if you have other questions. It’s nice to meet you Vilma. ☺️ I hope you are doing well! So you only have one rod like me? Some people have two.